Five Benefits of Scanning Your Body. Do you have a busy day, rushing from one thing to the next? Do others make demands of your time and attention? Do you ‘escape’ to other worlds found in media and books? If any of these resonate with you, chances are that you have little time for yourself! When this happens, you lose touch of with your body. You might say that you are no longer in your body. You are in your brain, or out there in another’s space, or in a land of imagination. Your body is the temple created for your spirit to reside in. 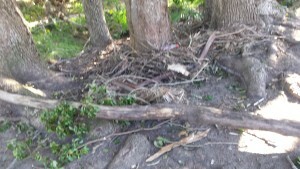 Like all places of residence, it needs to be cleaned, renewed, nourished and cared for. You need to be fully in your body to be able to nurture it and keep it in tip top condition and scanning is the skill that will help you do this. Scanning is when you pay attention to each part of your body by bringing your awareness to each part. Take a moment to direct your attention to the inside of your right big toe. Now take your attention; your inner eye into each part of your body. What do you notice in each of these parts? This is scanning. 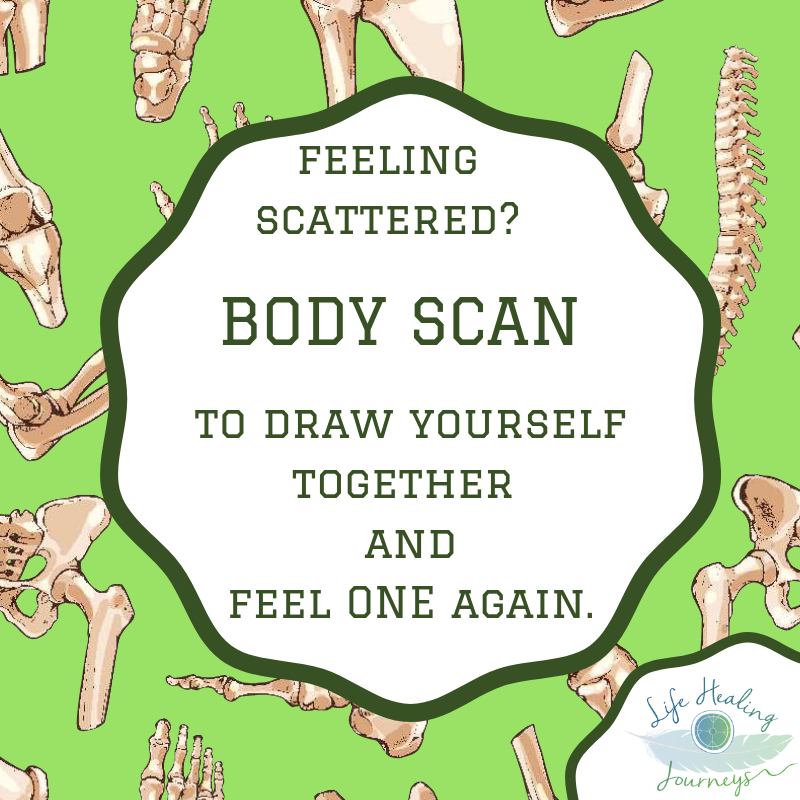 When you scan, you come to know each part of your body well. It is an important ingredient for becoming ‘Consciously Aware”. Benefits of Scanning your Body. 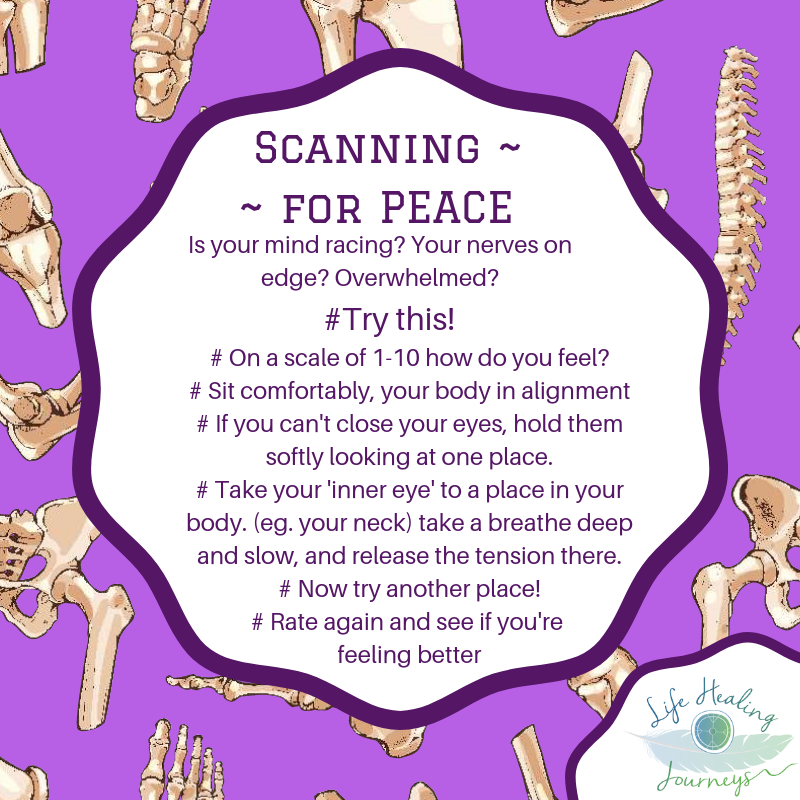 Scanning is a great tool for mindfulness. 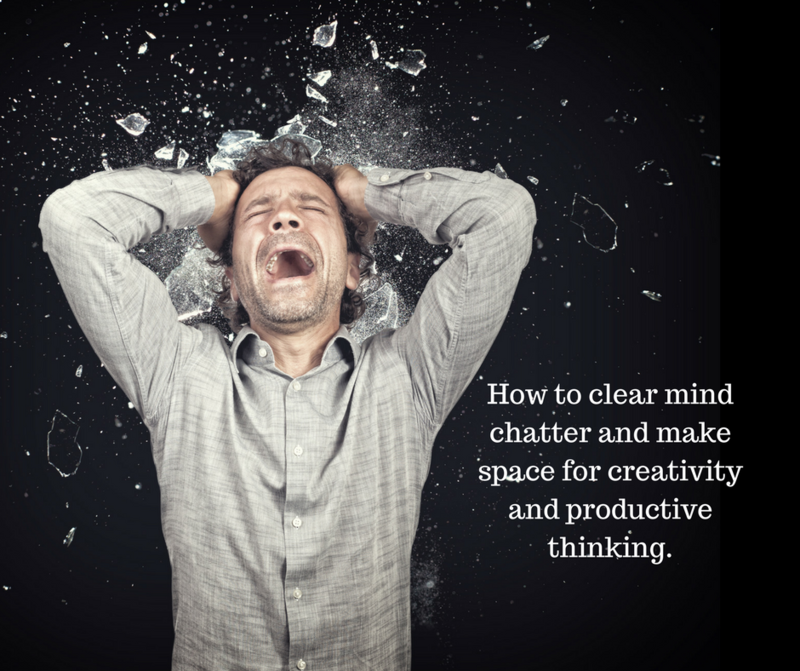 As you scan your body, you are engaging your brain in the process allowing your brain to be distracted from its ‘monkey chatter’. 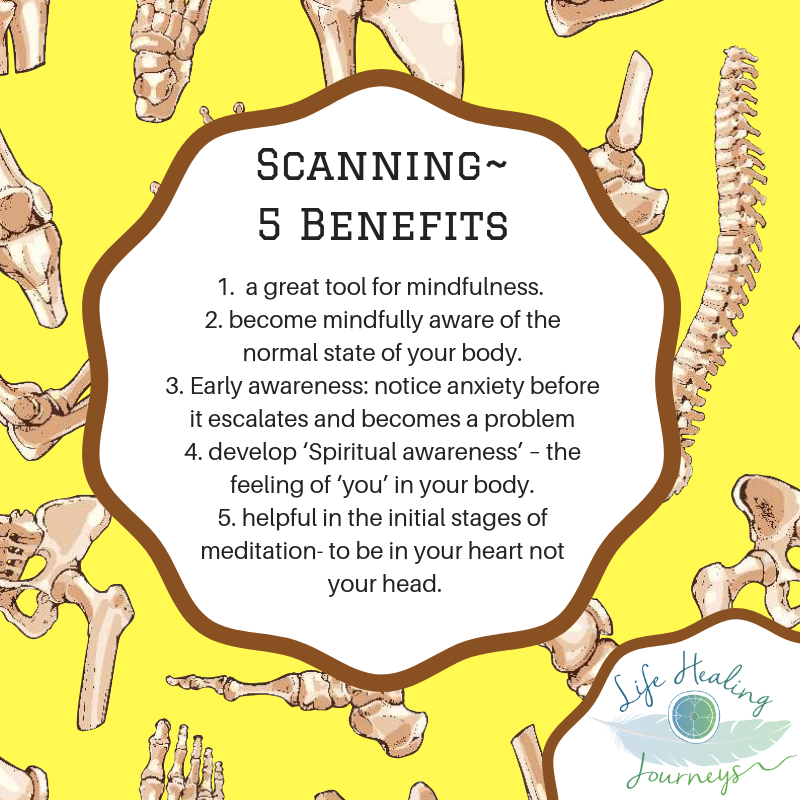 Through scanning, you are mindfully aware of the normal state of your body. As you use scanning, you develop ‘Spiritual awareness’ – the feeling of ‘you’ inyour body. Scanningis helpful in the initial stages of meditation – to relax and let go – to be in your heart not your head. I’m feeling a little ashamed and very disappointed myself following an argument I had recently. When conflict or other challenges arise in my life, I like to spend time with myself – my Inner Coach – and review what happened. I look at my part in the event and how I could have dealt with it better. Upon reflection I realised that my voice was raised and insistent, and the words I used were inappropriate choices fuelled by anger and frustration. Deep down I know that speaking this way didn’t help my ‘case’ and was not the most effective way of seeing through differences. I was feeling anxious and frustrated! I didn’t feel heard! It is such an important issue. I must have my say! My feelings, driven by a typical ‘fight, flight or freeze’ scenario expressed themselves openly through my voice, exposing my vulnerability, dissolved my credibility and held no respect for the other person. I was driven by my brain’s fear reaction, not my heart’s reasonable approach. Had I been able to call in my inner coach before the incident, the whole scenario would have played out differently! It is both wonderful and human to feel. With feelings come emotions that are fired by the brain – producing the physical effect of the feelings – in the physical body responding to the brain. These emotions are very powerful, and our bodies and brains respond willingly. Unfortunately, they don’t serve us well if we want to communicate well and speak our Truth. 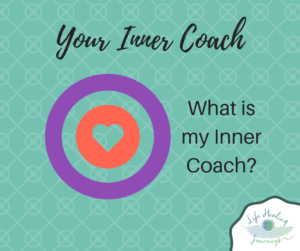 What is my INNER COACH? You’ve heard of personal coaches, business coaches, lifestyle coaches, and you know what they do. An inner coach does the same. Your INNER COACH is unique as it resides within YOU as part of your psyche. Your Inner Coach is one of what is called an archetype. Our psyche’s hold numerous persona that are archetypes. So, for example, if you decided to be the funny person at a party, you would be ‘a clown’ or if you became angry and stood over your disobedient child, you would be putting on your patriarchal parent. Understanding archetypes is material for another blog! It’s enough to say that we fall into using archetypes that have been modelled in our conditioning. However, we all have the ability to consciously choose which one to use in any situation. o knows your goals and mission in life and helps you to achieve them. o knows how you want to present in the world. o draws upon the processes and strategies you have learnt and helps you to create/learn new ones. 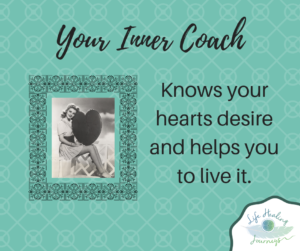 Your Inner Coach is a reliable guide that helps you make choices that are true to who you are, behave the way you want to be in the world and keep you on track to achieve your dreams. A coach has no use unless you properly engage with him/her, and it is your self-responsibility to do this. A coach doesn’t do the work for you. It’s your job to take action and your coach’s job to back you up, show you techniques and processes and support you. 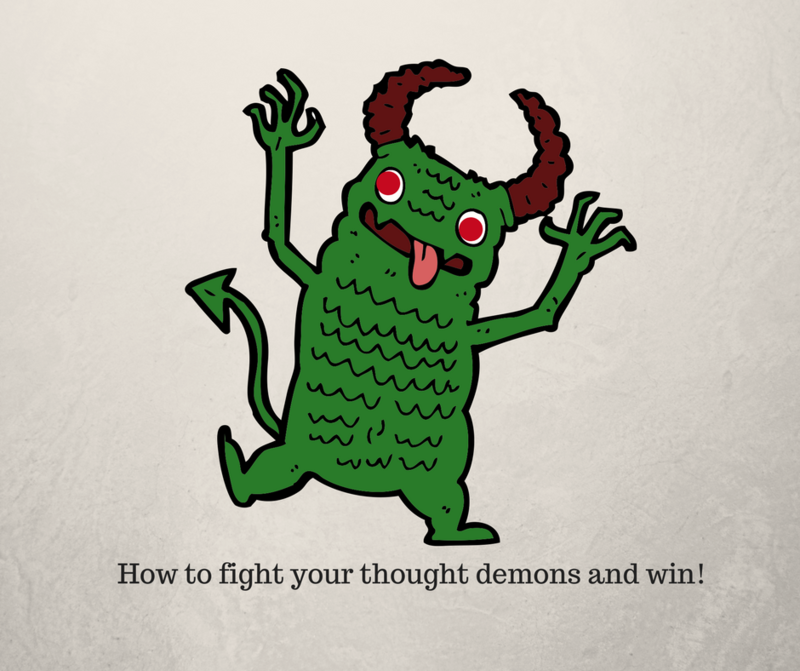 So, when your feelings are strong, and emotions are flooding your body, what do you do? You can either fold and succumb to your emotional overwhelm (victim), become aggressive (warrior), or you can listen to your inner coach and respond with integrity (wise woman/sage). Like anything, listening to your Inner Coach takes training and practice, practice, practice! Eventually your inner coach will be your constant companion guiding you in the way you want to be in the world. You know that gut feeling you have when things are happening the way you want them to? Have you ever had a function to go to and thought, “I don’t feel like going” … along with many other excuses and gone anyway. Then afterwards being thankful because you had a good time or met someone important for your journey? Hard decisions! 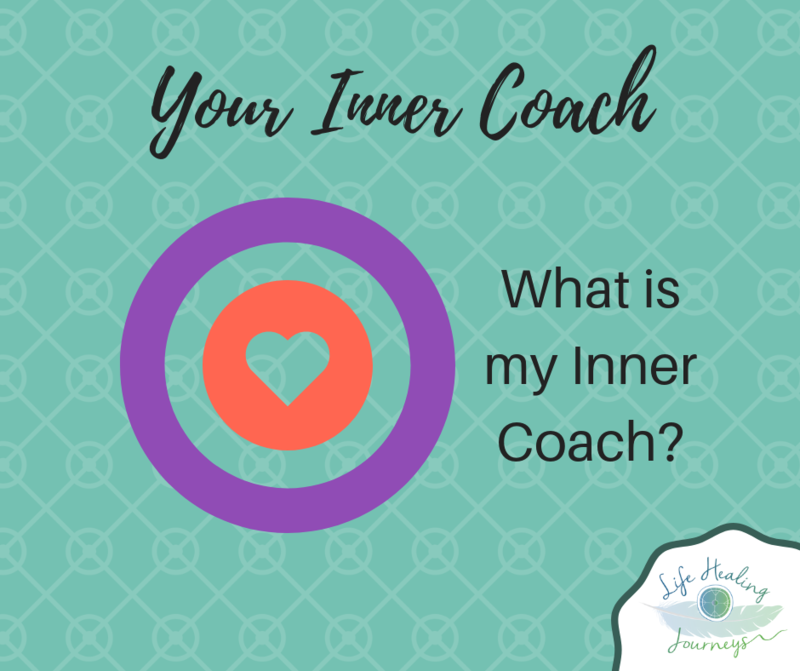 What does your inner coach say? o Remember your goal to lose weight? o Now is the time to make a decision that will support that goal. o What will happen if you choose the chocolate? To call in your Inner Coach, you need to do this consciously. The really beautiful thing about this is that you get to choose and be in the driving seat for the whole process. When you are consciously aware, you take notice of your body, your mind and all aspects of your environment. You notice how your body responds. You notice the words in your head and you notice the atmosphere of your environment and what is happening there. You also are aware of how you are behaving and the impact you are having on all that is around you. Begin by simply stopping and noticing. You will need to be serious and make a commitment to be aware in the present moment – to be ready to listen to your body and your mind and know what is going on there. Choose the voice and tone of your Inner Coach. It is helpful to consciously decide upon the voice and tone of your Inner Coach. For example, do you want a ‘bootcamp’ over-bearing inner coach or a wise sage? For some, the former has the effect of bringing out the ‘rebellious child’ archetype, which is the outcome of having a strict authoritarian upbringing, or from being a victim of Dickensian style schooling. You don’t want to be rebelling against your Inner Coach! On the contrary, some people have learnt to ‘snap to’ and respond instantly to this kind of authority. So, the personality of your Inner Coach needs to match the personality you respond to most easily and at the same time holds the wisdom and knowledge about what is best for you and your welfare. Conscious awareness only happens when you make a habit of tuning-in on a regular basis. Breathing, Grounding and Scanning are ‘The Building Blocks of Self-Care.’ These skills help you to tune into your body and mind, helping you to become self-aware and giving you the space to check in with your Inner Coach. How often will you check in? Three times a day? Every half hour? The ultimate goal is to be tuned-in most of the time! Whenever you are questioning or assessing, this is when you call in your Inner Coach. Life skills are an essential part of living that have been sorely overlooked in growing children into adults. The learning of these skills hasn’t been specifically taught and unless one actively learns and practice these skills, parent’s role modelling to children isn’t always a good example. A Catch 22 situation. The key to using good life skills is to listen to your Inner Coach. Simple? It’s as simple as committing to being consciously aware about tapping into your Inner Coach. When you are unaware – your decisions, quick answers, on the spot opinions – the way you are in the world – is informed and driven by the conditioning you have received through your life experience. You flow with this tide. When you practice awareness, you come to notice that what you truly believe, what you value and what you truly want in your life may not be reflected in your words and actions. You may find that the person that is you in the world isn’t showing up as the person who is truly you – your spirit. 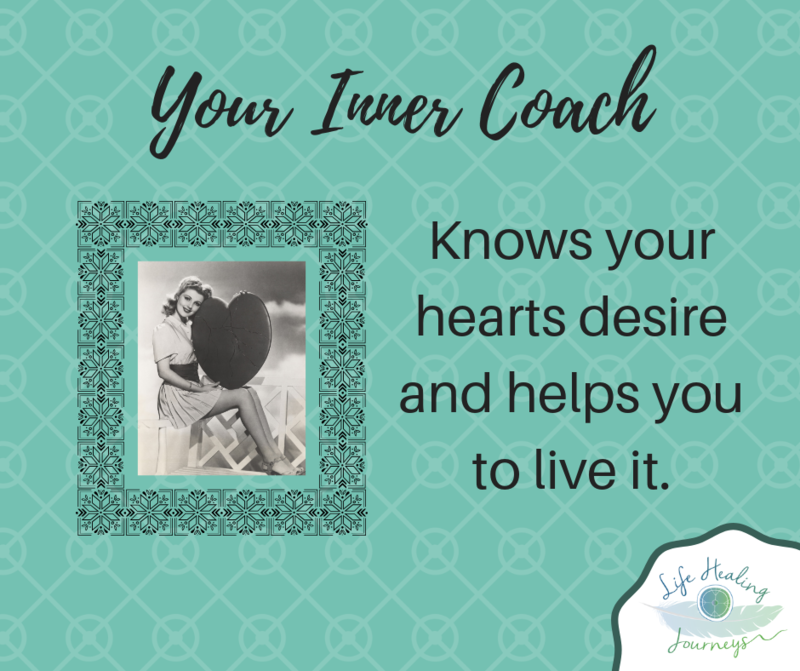 This is where your Inner Coach comes into play, guiding you to be your authentic self. Guiding you to live up to your values, your goals and who you are truly meant to be in this world. Connecting with your Inner Coach is one of ‘The Building Blocks of Self Care’ described in Betsy’s book. 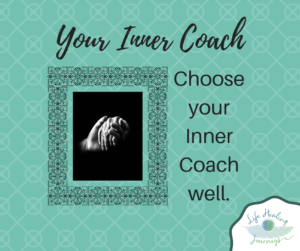 If you would like to connect with your Inner Coach, there are two options that would help you with this. One is to purchase Betsy’s book, ‘The Building Blocks of Self Care: what everybody needs to know’. Most effective is to have a ‘Calm and Connect’ session with Betsy either in person or by Zoom Conference. Physically grounding yourself is a ‘Building block’ that will start you on the path to knowing yourself well. After cleansing rain that had kept me inside, I went for a much needed walk along the local track along the creek. As I walked I consciously placed my feet one after the other carefully on the ground as the path was slippery after so much rain. 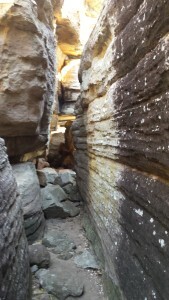 As I placed my feet I imagined the energy going from my hip, through my leg and down through the sole of my shoe into the ground, all the way down into Mother Earth. Along with my focussed attention, I used my breath, breathing in as I lifted my foot and breathing out as my attention went down my leg into the Earth. In doing this I was consciously grounding myself as I walked. This is a Chi Gong technique. Being grounded means that I feel the weight of my body upon the ground and I feel fully present within it. Becoming grounded happens when I become aware of my energy, my body and my spirit and they are in synch. unbalanced and when this happens I need to ground myself so that I feel complete; Whole, Balanced. The benefits are profound. First, the action of making a decision to do something positive (deciding to ground myself), to help myself feel better has a great impact on my mood and confidence. Add to this the benefits that occur when I ground, and connect my energy to Mother Earth and I have a new me! Being grounded is a mindful purposeful way of being that is accompanied with the feelings of confident surety. My feet feel that they are firmly on the ground. My voice sounds different too. Its tone, pace and thoughtfully chosen words reflect confidence and knowing even if I am on a journey of discovery about something that is new to me. This is definitely the better way for me to be AND I can CHOOSE to be this way all the time. How often do I need to ground myself? I make a practice of grounding myself every morning. Grounding yourself can be as simple as going outside and walking on the grass or bare earth. It helps if you do this mindfully – bring your mind into awareness of what you are doing, how it feels physically and you are feeling inside. One of the elements of Positivity described by Barbara Fredrickson is Inspiration. Being inspired is a quality that brings positivity. I’d like to invite you to play a ‘story’ game with me! I love sharing stories with other people, but even better, it is fun to hear the stories of others as I find them so inspiring. So please join in and share your ending to this story and inspire all of us! Every time we do, think or be anything positive, we are energising positivity; adding to the light shining in our world and balancing the dark that likes to consume us when we’re not aware. So, come on board and brighten the world with your story; fact or fiction is okay! Now it’s your turn! 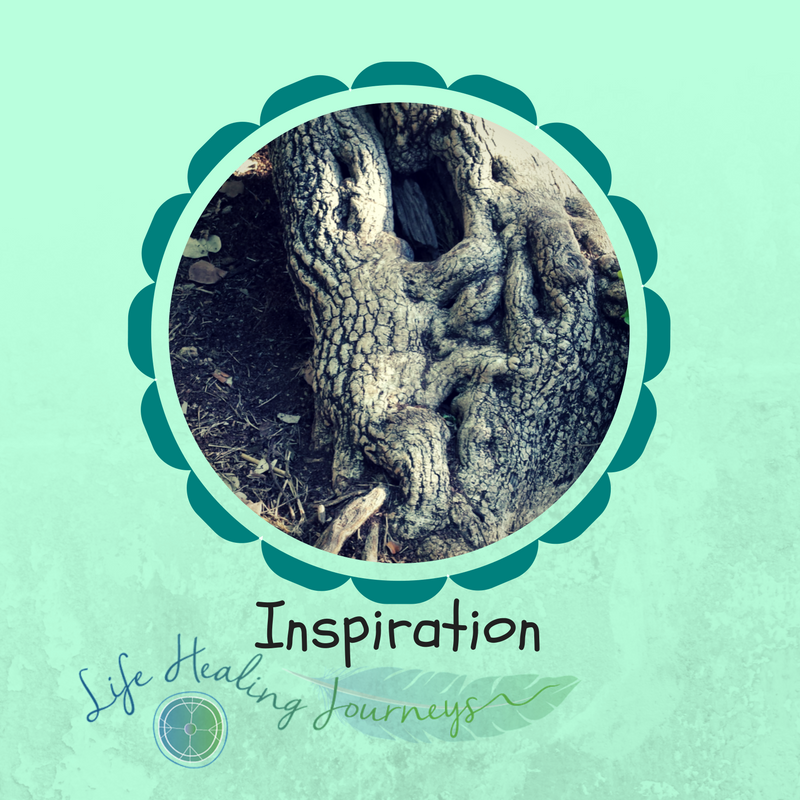 Come on, have a go and share your inspiration! And share the game so your friends can have a turn. 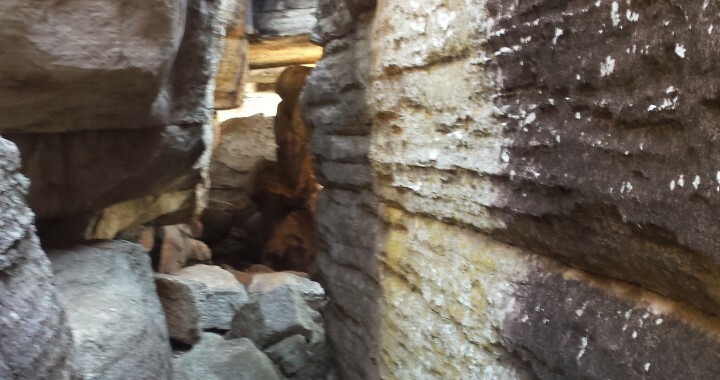 Shamanic Journeys can turn your life around. 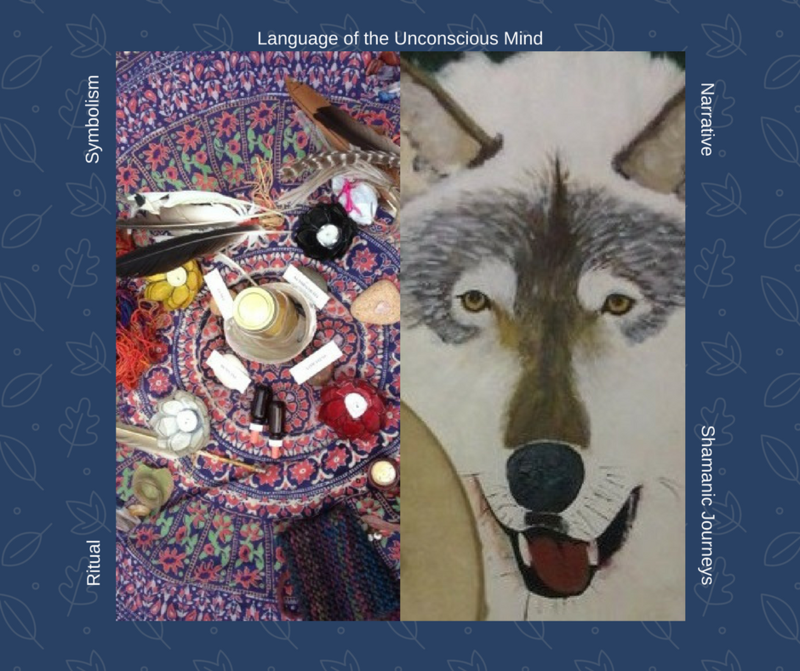 Shamanic Journeys use the language of the unconscious mind – ritual, narrative and symbolism – making them a powerful tool for transforming your life. Have you ever felt weak and unequal to a situation; times when you lack confidence? Have you noticed that you are repeating unhealthy situations/relationships in your life? Do you find that life is anything but happy and relaxed? Feeling threatened, not enough, stressed and anxious is soo uncomfortable. It makes life feel like a constant chore of survival rather than a walk in the park, so it’s very concerning that so many people live like this day in and day out. I wonder then, why more people seem to accept the way they live rather than looking for another way? It may be that life has always been a struggle and you aren’t aware that it can be different. It really doesn’t have to be so hard and uncomfortable. For example, John and Belle both grew up in families where their parents and siblings spoke in loud aggressive voices; in fact, if they didn’t they didn’t get heard. So, in turn, the family they were growing together was also full of the energy of conflict. They didn’t know that this is not the norm for everyone. It’s too hard to make change happen. Maybe you have tried to do things differently – you’ve separated from your partner and now you’re noticing negativity happening in your new relationship. This is really tough. It hurts in so many different ways, especially if you are trying to make change happen unsupported. I don’t feel comfortable about seeking help. When you ask for help, the invisible elephant in the room can be that if you ask for help, it means you’ve failed. Messages implanted in your brain from past experience can be your worst enemy. Asking for ‘help’ is better translated as ‘healing’, ‘guidance’, ‘education’. You are not a ‘victim’ who needs ‘helping’ – you are a person looking for a new way of life. 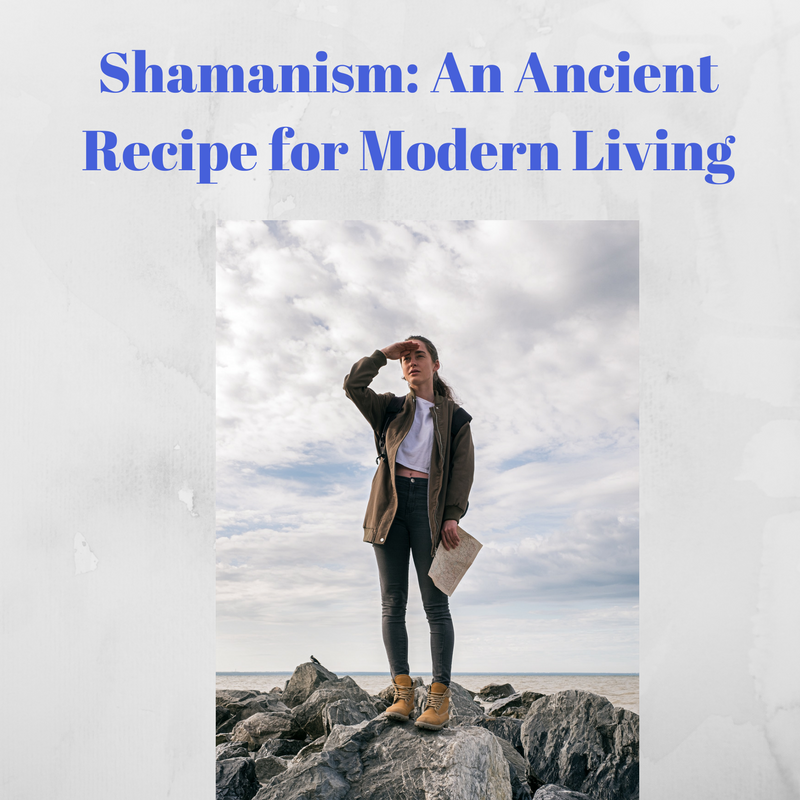 As a clinical counsellor, I looked for tools to support my clients and among the many modalities I learnt, Shamanism stood out. Many of the theories of modern psychology are drawn from Jung’s observation of indigenous communities across the world. Contemporary Shamanism applies them in truly practical ways. Like Indigenous cultures dating back to pre-historical times, contemporary shamanism recognises the power of ritual, of conscious awareness, of connection with nature, of the power of symbols and is a gentle and supportive framework that you can use to turn your life around. 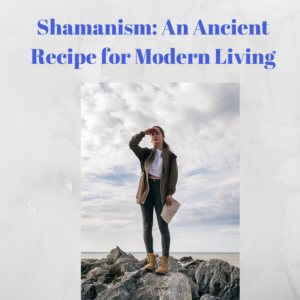 While engaging in these practices is my choice of life-style, understanding and embracing shamanic practice isn’t necessary for you to achieve impressive results. Experiencing guided shamanic journeys – individually or in a group – is a powerful vehicle for change. Take Jenny for example. She was tired of struggling to find her path in life. Her confidence was at a low point and she often felt life wasn’t worth living. She came to me because she wanted to be confident and strong. During our journey together, her traumatic childhood experiences, previously never told, were brought to the light and examined. The nature of the wounding she had experienced led to a deeper Shamanic Journey of ‘Soul Retrieval’. Following her Shamanic Journey, she no longer felt weak and inadequate. She felt complete, strong and more ‘together’ than she had ever before. Although there were more journeys to be experienced before she became fully into her power, she was well on the way. Jillian was stressed out and overwhelmed with work, family and study commitments. She never had time for herself. She decided to flex her work days and attend a Circle of Self-Care – a small group Shamanic Journey. During the journey, she learnt many techniques to bring self-care into her daily living and a plan to put them into action. She was armed with powerful symbols that she could call upon; symbols that helped her to be consciously aware of her stress levels and act before they escalated. Joan suffered shortness of breath and heart palpitations; anxiety and sometimes panic attacks. She knew about meditation and practiced it with a cd but when she attended meditation where she was guided to breathe correctly, scan her body and release tension, and learn mindfulness, she was able to take the benefits of meditation into her daily life and effectively manage her condition. We are all on this planet to learn and most often we are reluctant to examine the things that hurt in our lives. I urge you to wait no longer. Shamanic practices are powerful and yet gentle tools where guidance and techniques release you from hurt and restrictions; empowering you to live fully and joyfully. Positivity: How to change the consequences of things you cannot change. I leant into the cupboard to retrieve my art materials. As I came up to standing, I was at first curious and then shocked, as blood streamed across my vision – my eye was bleeding inside. Just like that! I was blind in one eye and even though I knew it wasn’t permanent, my life for the next months would be severely impaired. I couldn’t drive. I couldn’t see anything on my left side. Reading was a challenge – to name but a few of many things I now couldn’t do normally. Suddenly I had joined the ranks of the partially disabled. How could this have happened to me? 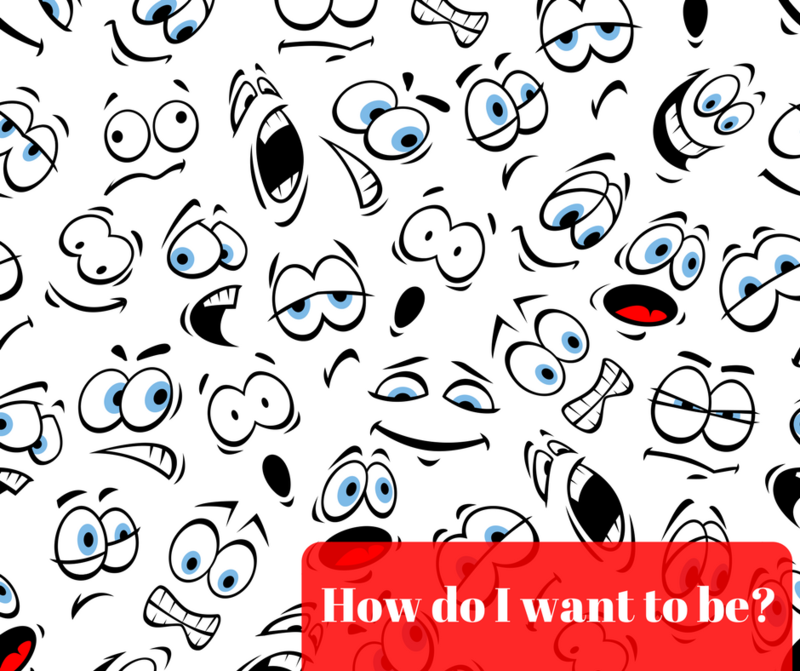 Emotional Choices: How do I want to be? Having a vital part of you taken away, whether it be physical or situational, is a recipe for disaster and deep depression. I was blind in one eye. My perfectly healthy body had let me down. I couldn’t change the fact that my eye was blind. Everything was a chore. Going to the shops was even more unappealing than it was before – dizzyingly so! Luckily for me, I have had an amazing life where I have been intensely curious about my emotions and feelings. I choose to live my life in a ‘shamanic’ way, and the guidelines of this path remind me to ‘live in the light’ and to ‘create joy’. This is what saved me from going down the depression path. I made a clear and conscious choice to make the most of my situation and be POSITIVE. How to be positive in a negative situation. It’s one thing to make a commitment and another to make it happen. How did I achieve being positive in what appears to be such a negative situation? ¨ I made a choice. I used to think that emotions and feelings just happened to me. 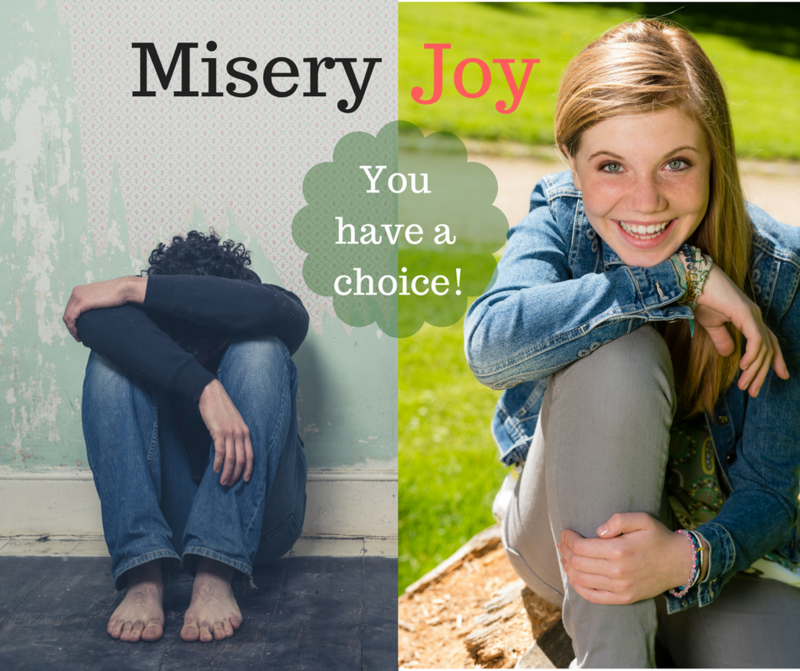 I now know this – I can make a choice about how I feel and dissipate the emotions that arise from negative feelings. I decided that I could choose to be miserable, or I could choose to shine the light on all the positive aspects of being forced to live my life differently. I discovered that, although I had previously been excited about my plans for the year ahead, I had quite a few projects I had put off for a long time and needed to complete. I now had purpose – I had found the positive outcome of my situation. ¨ I made a commitment. Making a clear and determined commitment is needed to help you follow through. This is true for any changes you choose to make. When make a commitment, there are two main things to consider. Firstly, write it as though it has already been achieved, and secondly make it concrete – write it down and put it where you can see it. ¨ I had a vision. Every morning I take time to vision my day or something of my choosing. In my situation, I came to vision myself feeling contented and happy doing the things I wished to complete. Visioning is traditionally thought of as having a visual image, but it is more than this. When you vision, bring your feelings into your vision – so visioning myself creating a dreamcatcher became – me feeling the joy, curiosity, serenity, inspiration as though I was present, doing it, in my vision – focus on the positive feelings. ¨ I transformed the negative. Shamanic practice has taught me to be consciously self-aware. This is such a great tool. It means that I notice when I’m feeling negative before it can get too much of a hold on me. I have learnt to feel into it; acknowledge the feeling and its details. Acknowledging it brings it to the light – out into the open so that I can choose that this is not how I want to be, and change my direction. ¨ And looked for positive. In her book “Positivity”, Barbara Frederickson says that moments of positivity come in tiny windows. None of us are positive all the time, or we wouldn’t be able to operate in this world. What I have learnt from her research, is that you can catch the fleeting moment when positivity occurs. (conscious self-awareness) MAGNIFY it. CELEBRATE it. CREATE JOY with this moment. Throughout life things happen to you that you cannot change. It is easy to fall into despair and become immobile. If you’re feeling like you’re falling into a great hole, falling often feels like the path of least resistance because you have no resources to do it differently. Doing it differently requires you to step up and do something to change the consequences of those things that you cannot change. Stepping up means that you have made the choice to find the benefits and illuminate them and bring them into being. The steps above are designed to help you to act to become positive – in small do-able parts. Because it is difficult to action new ways of being without knowing what it feels like to be that way, Life Healing Journeys provide you with the opportunity to immerse yourself in this process with compassionate guidance. 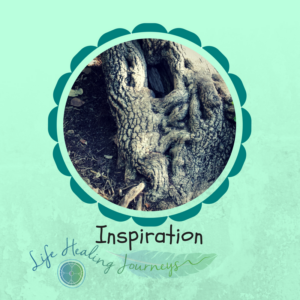 Life Healing Journeys come in many forms; individual sessions, small group circles and workshops. These are advertised on lifehealingjourneys.com.au and by newsletter.